U.S. Senator Dianne Feinstein speaking at the media event Thursday. Officials from Metro and the Federal Transit Administration signed a pair of agreements Thursday that will provide a $670-million federal grant and a $160-million federally-backed loan for the Regional Connector light rail project. The total budget of the project is $1.37 billion. A media event with public officials is being held at 10 a.m. next to the Gold Line’s Little Tokyo station. We’ll post photos and video later today. In practical terms, the agreements clear the way for construction to begin later this year on the 1.9-mile underground light rail line in downtown L.A. that will tie together the existing Blue Line, Expo Line and Gold Line with tracks between 7th/Metro Center and Little Tokyo. When the project is complete — forecast for 2020 — passengers on those lines will be able to travel through downtown without having to transfer to another line. The project will also allow trains to run more frequently through downtown. Blue Line and Expo Line trains currently must turn around at 7th/Metro Center, a time-munching maneuver. Utility relocations on the project are already underway with construction expected to begin later this year after the Metro Board of Directors selects a contractor to build the line. Metro already has three light rail projects currently under construction — the Crenshaw/LAX Line, the Expo Line and the Gold Line Foothill Extension. The first phase of the Purple Line Extension of the subway is also expected to sign funding agreements with the federal government later this year, allowing the Metro Board to select a contractor to build that project. That means that within the next calendar year, Metro could have an unprecedented five rail projects being built simultaneously that will add about 29 miles of rail to the existing 87-mile Metro Rail network. All five projects are also receiving significant funding from Measure R, the half-cent sales tax increase approved by 68 percent of Los Angeles County voters in 2008. The Connector is the first Metro project to receive a federal New Starts grant since the Eastside Gold Line, which opened in 2009. New Starts is a federal program designed to help local transit agencies build expensive transit projects. The loan is coming from the federal TIFIA program, which helps local areas secure low-interest loans that are cheaper than loans found on the open market. The TIFIA program is part of Metro’s America Fast Forward initiative that was expanded in the most recent federal multi-year transportation bill. Metro is seeking to have the program renewed and expended in the next bill, which Congress is expected to debate this year. The Connector was originally envisioned as a rail project that would run at street level through downtown. Public opinion, however, swayed Metro to put the line underground, which increased costs but will also provide faster travel speeds and eliminate the need for a rail undercrossing at Alameda Street. The increased cost is the reason that federal funding is crucial for the project. Metro joined federal, state and local elected officials today to announce the receipt of a Full Funding Grant Agreement (FFGA) from the Federal Transit Administration in the amount of $670 million to fund the $1.37 billion Regional Connector Project. 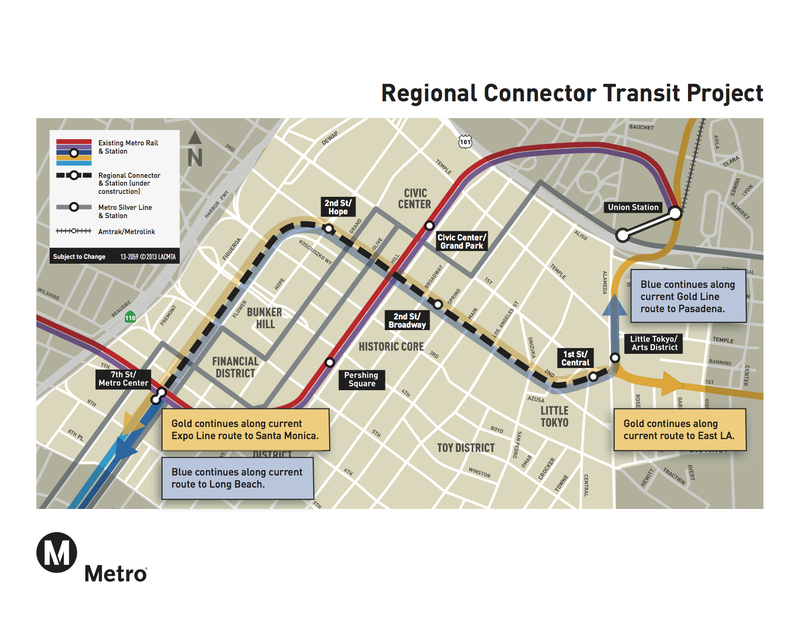 The Regional Connector Project completes a 1.9-mile gap between the Metro Blue Line and the Metro Gold Line by providing a direct connection with three new stations planned for 1st Street/Central Avenue, 2nd Street/Broadway and 2nd Place/Hope Street in downtown Los Angeles. The Regional Connector Project is an important rail connection project overwhelmingly approved by the voters and funded by the Measure R half-cent sales tax ordinance for LA County transportation improvements. The FFGA with the federal government now secures completion of the project. “By committing $670 million to the Regional Connector, the federal government becomes a true partner in helping Angelenos build world class transit, create local jobs, and spur the region’s economy. When Angelenos approved Measure R in 2008, they made a solid investment in changing the way people moved throughout Los Angeles. The Regional Connector is a critical part of making that vision a reality. It is a prime example of how we return our federal tax dollars to our community for local projects that generate jobs and economic growth,” said Congressman Xavier Becerra (CA-34), Chairman of the House Democratic Caucus and representative for Downtown Los Angeles. The Regional Connector Project, expected to be completed in 2020, will attract nearly 17,000 new daily riders and provide access to more than 88,000 passengers saving commuters up to 20 minutes off their daily commutes. It will provide a one-set, one fare ride for commuters from Azusa to Long Beach and from East Los Angeles to Santa Monica without the need to transfer between rail lines for major east/west and north/south trips. In addition to the FFGA, the U.S. Department of Transportation has granted Metro a loan of $160 million for the Regional Connector Project from a Transportation Infrastructure Finance and Innovation Act Loan (TIFIA) to complete the funding package for the project. For more information about the regional Connector project, visit metro.net/projects/connector. In addition, stay informed by following us on The Source and El Pasajero at metro.net, facebook.com/losangelesmetro, twitter.com/metrolosangeles and twitter.com/metroLAalerts and instagram.com/metrolosangeles. will the current and future gold line route continue to go to East LA or will only the Expo line go to East LA? Will the Long Beach to Pasadena line be named the blue or gold line or both? Tell us what Metro is envisioning with regards to the routes and names. Excellent news for Metro and Los Angeles County. Our case for a Summer Olympics in 2024 is getting stronger and stronger as we extend our metro system. Will the Little Tokyo / Arts District Station remain after the new 1st St / Central Station is built? Or will it be demolished and consolidated with the new 1st St / Central Station? Any chance of it opening before 2020 and adding the WTC stop back in? Anything is possible but I don’t think it’s likely. The station would require a lot of money and likely changes to the environmental document governing the project — and I’m unaware of anyone pursuing those funds at this time. This is wonderful news! I do have a few questions though. Currently, coming from the Long Beach/Lakewood/Compton area (Del Amo Station) it takes anywhere from 1.5-2 hours to travel to Downtown Pasadena (Del Mar Station) using the Blue, Red, and Gold lines. With the Regional Connector how long is the trip now expected to last? Also, are there concerns of safety now that the Gold Line will be traveling down the tracks in downtown which the Expo and Blue Lines currently use? Is it safe to have three trains running on one track in such a busy area? I’d appreciate your feedback! Thanks! Those are subject to change, but that’s the understanding today of the future Metro rail system. Happy that Metro got the grants and loans. But considering that, I think Metro should re-analyze their upcoming fare reform structure. Sounds great, but in one caveat. Under the current fare restructuring proposal, which is a flat rate fare hike to $2.25 with free transfers, that means a person could be paying $2.25 from Santa Monica all the way to East LA or from Long Beach to Azusa, a 40 mile trip, while a passenger who only needs to take a one or two station trip less than a few miles away pays the same $2.25 price. Overall, I think this will only change people’s habits to use Metro Rail solely for longer trips because it’s a better deal to cover 40 miles in $2.25, while people will still continue to use the car for shorter trips because no one wants to pay $2.25 for short distance travel needs. What that will do is only alleviate traffic jams on the freeways, but does nothing to alleviate traffic on local surface streets. Instead, it might end up pushing more car traffic to local surface streets. If Metro wants Angelenos to give up their cars for both short and longer trip use, they need to come up with a better solution than a “pay the same price no matter how short or far you go” model. A zone pricing structure would make sense in that case, like what you see on the Paris Metro system for example. But i do already see some semblance of a possible zone structure that doesn’t seem to be implemented on the red line map. These can be seen on the trains themselves. I always thought that was there in the event they began a zoning price structure. But that is merely an educated guess. One of the three new regional connector underground stations will NOT have a mezzanine. Is this a bad thing? I hope that at some point Metro will have a better connection between the Silver Line and Union Station. Currently, the stop for the Silver Line at Union Station is difficult to find unless you are familiar with it’s location. One time I walked out of Union Station to find the Silver Line. Did not find it at all. I had to walk back to Union Station and catch the subway to Civic Center Station to find the stop for the Silver Line. Agreed. With the Regional Connector getting built, the coverage of the Metro Rail system is expanding so far out that the longest trip covering over 40 miles and running a flat rate structure while those who only have a need to ride it for one or two stations for the same price is nuts. Fares shouldn’t be a fixed per boarding charge, but rather a variable range of somewhere between $0.50 for the shortest trip to a maximum of $5.00 daily cap. This shouldn’t be hard to do. Fill up TAP with cash value, TAP in and TAP out, deduct fares based on distance. When it runs out, you fill it up again, or have an automatic reload setup. Automatic daily, weekly, and monthly caps can be put into place so that they act like a de facto daily, weekly, and monthly pass upon reaching that mark. Filling up gas, filling up TAP, using up gas, using up TAP, re-filling up gas, refilling up TAP, it’s practically the same. There’s no confusion about it. Zonal fares or distance fares, we need to move to a more variable fare structure. A flat rate fare structure isn’t going to cut it if the longest Metro Rail line is extending out to the 40 mile mark. This is a waste of money. You should really focus on creating a light rail system that will connect the Valley to Santa Monica. We all know the 405 is a mess…think of the revenue, you’re welcome! Somebody please remind Roybal-Allard that by accepting federal funds, Metro has to hire any qualified U.S. citizen to build this, not just “locals”. How about a rail line that connects the eastside with the westside? Uh duh, how is this not a thing? Any improvement is good, but rather than improving what exists I would rather begin service where it has been needed for a long time. Currently there is no reliable or practical service to Burbank which could be called the true entertainment center of Los Angeles with Disney, Warner Brothers, the former NBC studios and numerous video production companies. Metrolink has poor service for entertainment companies whicj operate 24/7 and cannot be considered viable transportation. If you want to expand the Gold Line or create a new Line, how about spending this 1 billion dollars on putting a train down the center of the 134 and 101 all the way to Calabasas? Providing transportation from both directions into Burbank and Studio City where easily 500,000 people commute to and from work daily. Or why not beginning service the entire stretch of the 405 from North Hilss to Culver City also? Instead of spending money on improving what we already have it is time we think bigger and initiate service elsewhere. For all those who want Metro built to your backyard or at your particular job. Metro is expanding a local system that is expensive and takes time. I’ve noticed in Los Angeles, people complain that Metro doesn’t come to their doorstep rather than move to where Metro is. Next time you look for a job or look for a new place to live, consider where Metro is. I moved to Downtown because it was the best choice for Metro. Los Angeles needs density served by Metro, bikes, and walkable neighborhoods. Don’t expect Metro to serve every single suburb and random small city in the region. Expect the core of Los Angeles to densify and the far flung suburbs to stay the same becoming bedroom communities. New development will and should happen around Metro stations. Also keep in mind that some far flung ‘burbs not only provided little financial incentive for Metro, but the locals there will likely fight it every step of the way, making it a no-brainer not to do it. Even Santa Monica is fighting density, meaning places like Downtown LA will benefit from most of the density demand that Santa Monica pushes away, making even more sense to invest it Downtown’s Metro system. Jobs will also follow Metro to Downtown. Many jobs today in places like Burbank will relocate to Downtown to stay competitive and attract better talent. I do not believe anyone is asking for Metro to place their lines at our doorstep, but we do expect them to resolve all transportation needs. We are so far behind the rest of the world it is ridiculous. It will take decades and billions upon billions of dollars to accomplish this, but right now spending 1 billion dollars on a Regional Connector is not where I believe these funds should be used. We are not asking them to dig a hole through the hill that separates the Valley from Bev Hills, but L.A.’s main industry is not revolved around downtown and Union Station. It is Burbank, Studio City, Bev Hills and West L.A. The main objective is to get cars off the freeways and this can only be accomplished if they create new train service that accomodates this.